Just wanted to post some photos of Kona’s food! 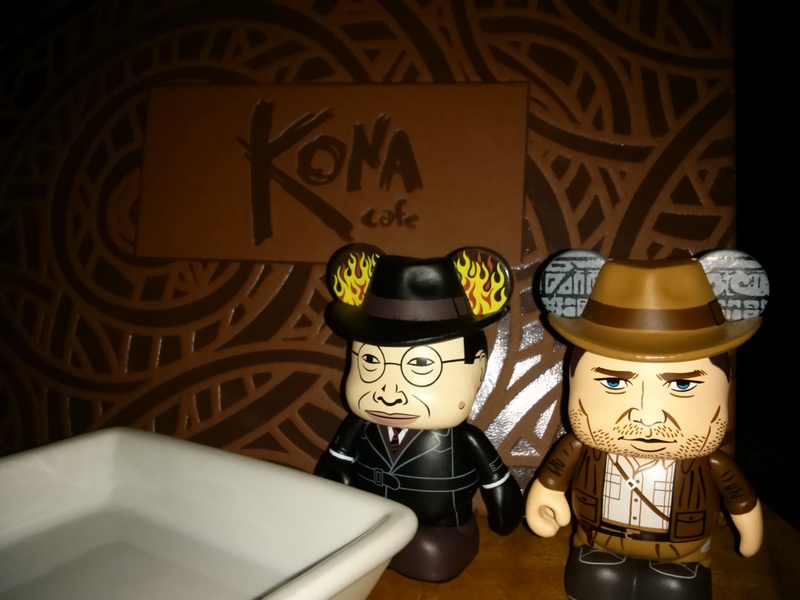 I just had to include a photo of our Vinylmations that we got from trading at Magic Kingdom that day, two Indiana Jones figures in one day! I think they were hungry. 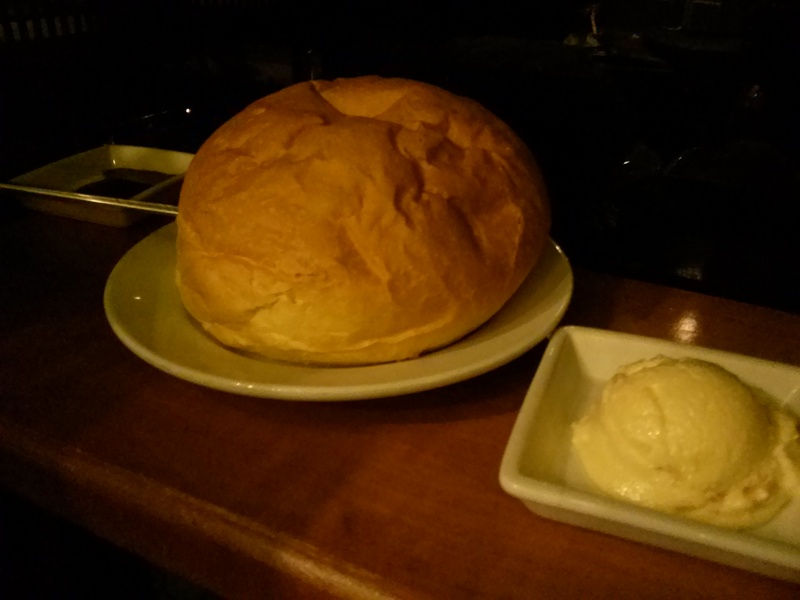 Kona Café Hawaiian Bread with Macadamia Nut Butter – Delish! I love when the bread is hot and fresh, it’s slightly sweet, very soft. Mmm. Macadamia nut butter. 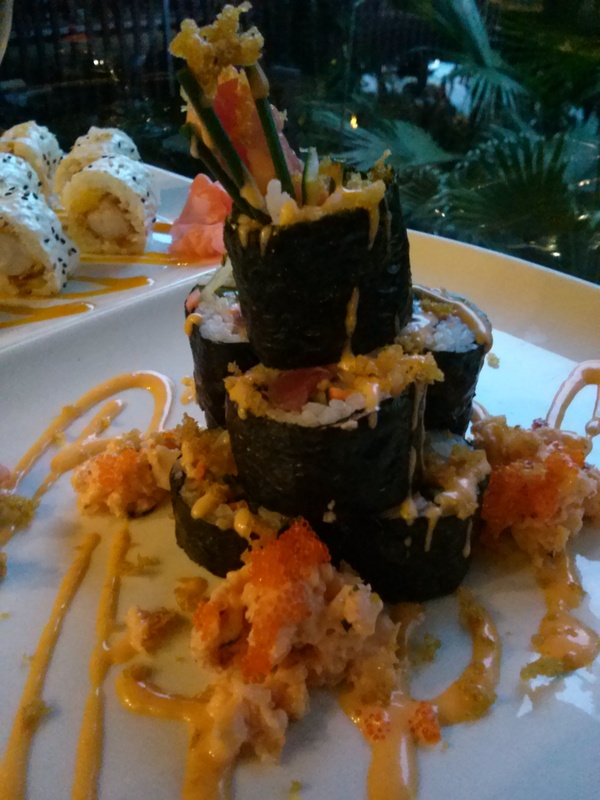 The Volcano roll has Spicy Tuna with Seafood Lau’ai (like a little bit shrimp salad) with Tempura Crunch. 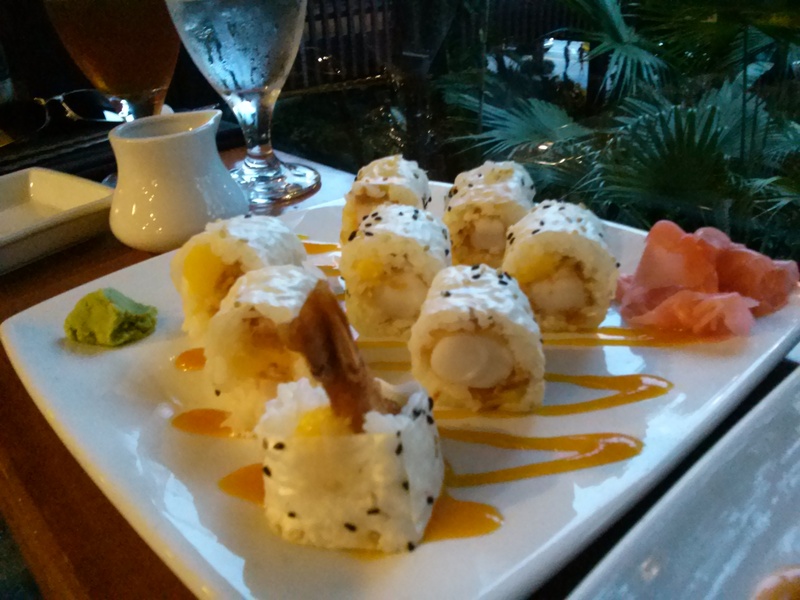 This roll has Tempura Shrimp and fresh Mango served with Liliko’i Sauce (made from the passion fruit). I don’t know what the white wrapper around the sushi is, but I like it. I think it’s a soy based wrapper. Sesame Seared Sea Scallops with Rice, Wakami Salad, Edamame, and Tarragon-Champagne Beurre Blanc. 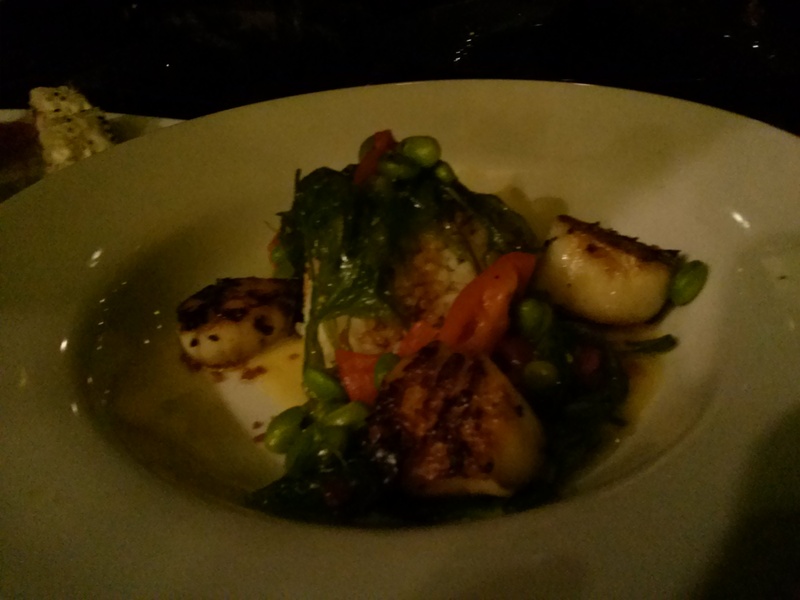 This was very good, the scallops were cooked to my liking, it was delicious. I want to try some other sushi rolls, but I we like these so much that we never seem to try anything new! I think I’ll get a Lava Roll next time, I have a feeling it’s going to be similar to the Spicy Kazan Roll at California Grill, it looks similar and has similar ingredients. The Lava Roll has Togarashi-spiced Tempura Shrimp, Bay Scallops, spicy Mayo, and Chives. Sounds good to me. P.S. Kona Café also has an awesome breakfast menu, I love the Tonga Toast. One of the best things I’ve had from Yak & Yeti was the Seared Ahi Tuna Salad. I was worried I was going to be disappointed with this when I ordered it. So many times when you order an entrée salad, you can easily be let down, either the portion size, or greens, or dressing is just not right. Well, I was so pleasantly surprised when our waitress brought my salad. It looked amazing. Exactly what I was in the mood for, it was hot outside and I just wanted something light and tasty. The seasoning on the Ahi was so good, it actually tasted a little like a steak. The ginger was fresh and the dressing was perfectly complimentary to the salad. The greens were abundant, no iceberg lettuce to be found. Fresh veggies all mixed in like carrots, sprouts and more. I did find a couple tiny specks of wilted lettuce but it was 99% perfect. 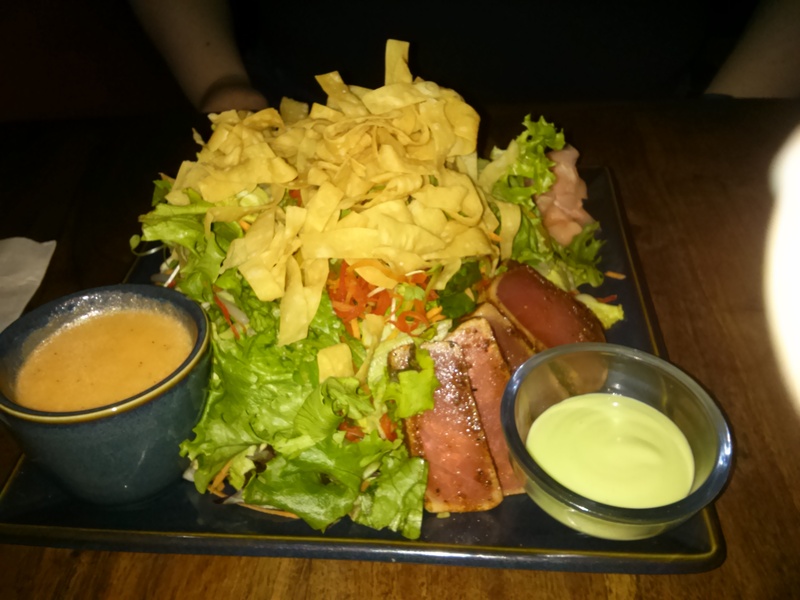 The salad was HUGE, big enough to share. Next time I’ll probably have them hold the wonton bits. This is our ‘go to’ meal, when we come here we usually both get the Mahi Mahi, but this time I got the salad, and my husband got the usual. They do an excellent job on this dish, it’s crispy but not greasy. I love mahi, it’s one of my favorite fish because it’s just not that fishy at all, it has a firmer texture too like cod. 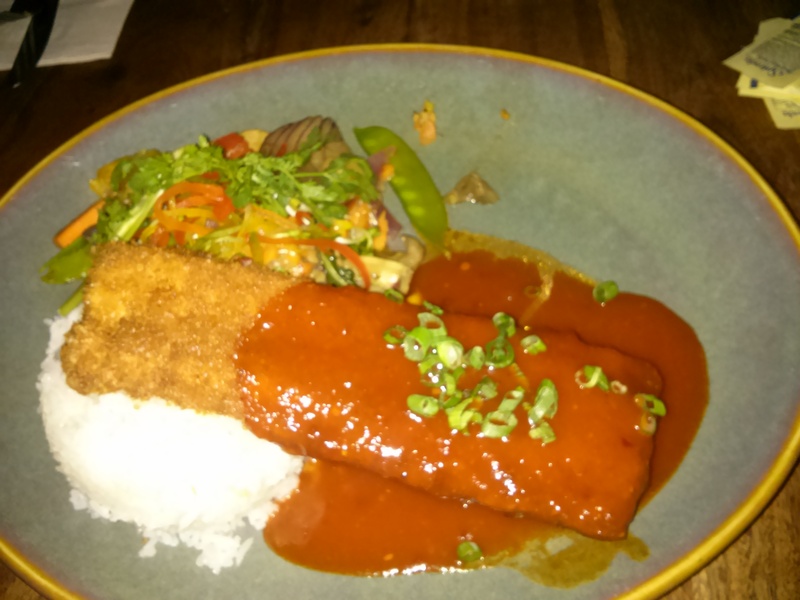 The sauce, veggies, and rice go well with the fish, it may not be the healthiest meal since the fish is fried, but you have to splurge every once in a while. Speaking of splurging, they have the most delicious wok-fried green beans too with a sweet-spicy dipping sauce. We always split an order, they are just that good. And don’t even get me started on dessert, their cream cheese wontons with grilled pineapple and strawberries with small serving of vanilla ice cream is also a real winner, the pineapple is fantastic. We’ve heard some good things about their mango pie, I haven’t tried it yet, but it always comes highly recommended by the staff. Yak & Yeti is located in Animal Kingdom Theme Park, you do need park tickets in order to eat here. It’s located in the land of Asia, follow the signs that point that way. The restaurant is decorated with authentic Asia furniture, statues, decorations, carvings, and more. They will usually tell you this when you are being seated, and they also invite you to look around the place, there is an upstairs too if you feel like looking around. If you prefer to eat a casual meal or just have appetizers, drinks, or desserts, you could also eat right at the bar. It’s small and seats maybe 6-8 people total. The bartenders are usually very friendly. They have Kirin Ichiban on draft, and their prices seem reasonable – for Disney prices! If you have a Landry’s Card, you get points for dining here. A Landry’s card is also beneficial if you dine at T-Rex, Rainforest Café, and dozens of other places around the USA. It costs $25 to join their club, and they will credit you $25 towards your next meal at one of their participating locations. It’s worth it to join because they also give you a $25 gift during the month of your birthday, in addition to loyalty rewards that you earn ($250 spent gets you another $25 reward) you will also get what they call priority seating, at busy times you can walk-in and get seated faster than someone else without the card. If you are in a group of people and no one else has a Landry’s card, you can use yours and get the points from the whole group. 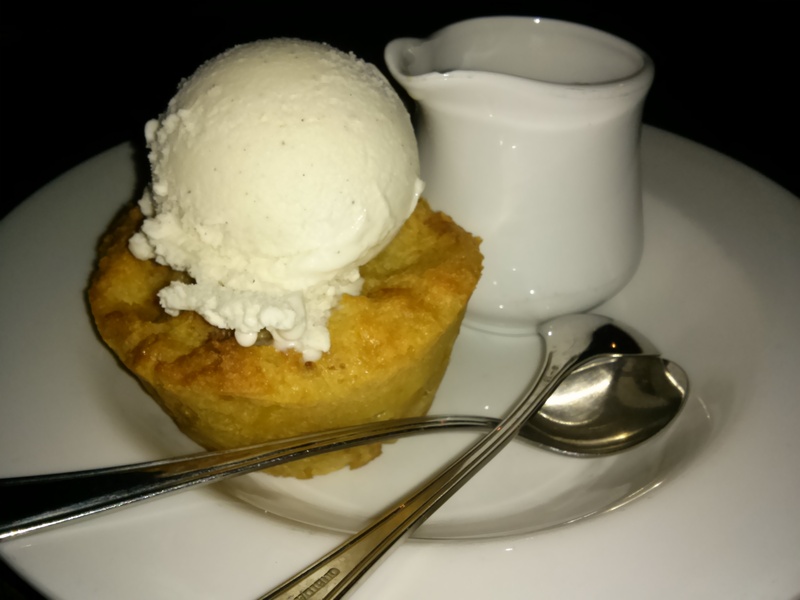 I was so happy to discover the ‘Ohana Bread Pudding on the Tambu Lounge menu. It’s about time! It’s my favorite part of the ‘Ohana meal, and now you can just get a small serving almost anytime you want. 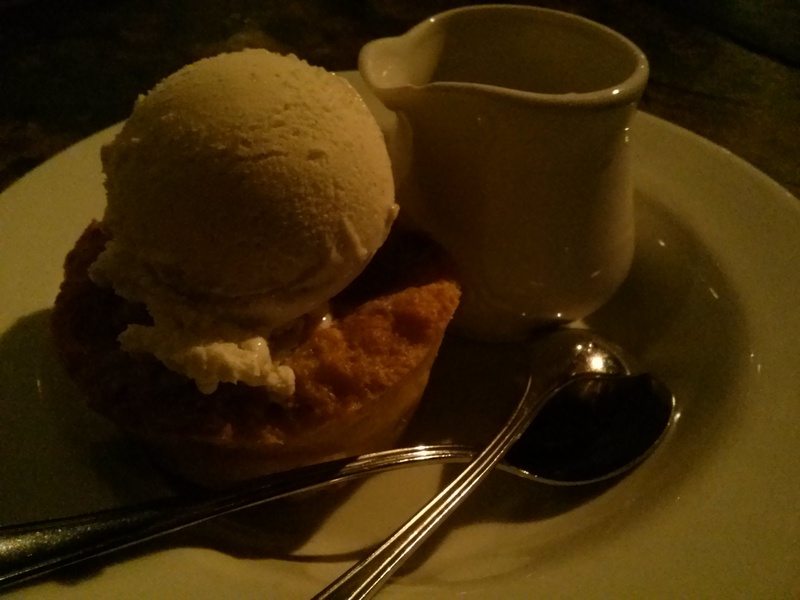 It was served with a scoop of vanilla ice cream and a small side of the Banana Foster sauce. The Tambu lounge stops serving food at 10pm. The price was $4.99 plus tax and gratuity. Unfortunately, I couldn’t quite get a good photo with the lighting at the bar. I was in a hurry, I think a lot of people hate when others take photos of food, so I always feel odd when taking them. My husband and I had wanted to try California Grill for long time and had finally gotten around to making an ADR scheduled almost 6 months away. They recently had done a renovation and had reopened. It seemed like too long to wait to try the sushi so when I found out we could try the food without a reservation, we just had go sooner rather than later. If you eat in the Bar or Lounge area, you can go to the check-in desk and see if seating is available in the bar or lounge. Once seating is available, they will take you up to the restaurant. We waited about 15 minutes or so before they were able to accomodate us. It was really crowded up there. We were able to find two seats at the bar. We got settled in our seats and looked over the menu. We were really interested in trying the sushi, so we asked for a recommendation. The Spicy Kazan was highly recommended as one of the best and most popular items. We ordered the Spicy Kazan and the Dragon Roll, since we both really love tuna. It was getting near sunset, we enjoyed a panoramic view of the Seven Seas Lagoon before the sun had set. The sushi was pretty good, I couldn’t say it was the best I’ve ever had in all honestly. The Spicy Kazan roll was good, but the sauce overpowered the flavor of the crab. High quality crab meat can stand on it’s own, and it seems lost in that dish, honestly I just couldn’t tast the crab at all. They could have substituted shrimp and it would have tasted the same to me. I want to try their flatbread next time and see how it stacks up against Jiko’s. The service was a little slower than we hoped for, but I know they were working hard and they were very busy. I’m not a wine drinker but they did have a large selections of wines available for you oenophiles. My husband ordered two different craft beers (Founders All Day IPA and Coronado Brewing Co. Orange Avenue Wit) with our meal, he didn’t enjoy them as much as he thought he would because they weren’t that complimentary to each other and neither paired well with the sushi. Trying California Grill made me appreciate the sushi selection at Kona by comparison, because although California Grill was perhaps slightly better (and that is debateable), it wasn’t really leaps and bounds better than Kona Island Sushi. If I was more adventurous I might find something on Kona’s menu that I like better, I usually order the Volcano Roll. We used our Tables in Wonderland card, and the price after tax and tip was $75.00 for two rolls, two high end craft beers, and an iced tea. We could have had a similar meal at Kona for less, but the view just isn’t the same. I was really expecting a spectacular sushi roll, and what we got were just slightly better than average. I overheard someone say that Califonia Grill was one of the top 25 sushi places in the world, I don’t know if that is true, I highly doubt it. It was overpriced in my opinion for what it was. It seemed that the price is really partly based on location here, it’s such an exclusive and unique place, that they could set their prices however they like and people would still come. There are some window tables in the lounge if you want a better view. If you are there during Wishes, there is an observation deck where you can go outside to enjoy the fireworks. If you are feeling adventurous – give it a try. Go for drinks, or split a sushi roll. Just keep in mind you are paying a premium for the view and be sure to enjoy it. On the very busy opening weekend of the Marketplace Co-Op, Downtown Disney was packed! We attempted to park near Marketplace, and decided to come back later because it was just too dang full. There is even more construction going on down there since they have started the Disney Springs renovation, part of the parking lot near T-Rex and Raglan Road has been blocked off. Traffic flow had been restricted. We decided if we had enough time, we’d come back later before they closed. We went to Hollywood Studios for a couple hours and then figured we may have a chance to make it to the new store with only about 20 minutes to until they close. We managed to find parking and get into the store about 7 minutes before they closed. Didn’t have time to take any pictures, maybe next time. I really wanted to look at the theme park merchandise and home goods, we had enough time to take a look at the items. They have items representing the different lands of Magic Kingdom, as well as some of the beloved rides and characters. Orange Bird, The Haunted Mansion, 20,000 Leagues Under the Sea, Beauty and the Beast, plus items that have a vintage looking flair – tiki glasses, hurricane glasses, high ball glasses. Among the items were also small pillows and throws, plates, bowls, snack bowls, and cool looking signage. There was plenty to look at and not enough time. There are a few other themed boutiques in the building that house other types of merchandise. We purchased a couple plates, a couple coasters and a glass cutting board. I really liked the signs, but some of them are upwards of $200. For anyone looking for cool and vintage Disney themed home goods – this is the place. You will want to buy so many things it’s ridiculous. P.S. Can’t wait for them to through with the construction, it’s just aggravating. Trying to figure out how best to use the Deluxe Dining Plan can be a little bit overwhelming. Once you have decided to go with the Deluxe Dining Plan you then have to decide which restaurants to book, but how do you decide? Some of the restaurants we will book when using the DlxDP are: Tutto Italia, Via Napoli, Teppan Edo, Chefs de France, Yak and Yeti, San Angel Inn, Coral Reef. I choose these based on the cost of the menu items, each of these places have higher cost entrees, appetizers, and desserts. I have chosen Teppan Edo specifically when on the Dining Plan because they do not accept Tables in Wonderland discounts. So, it’s more cost effective for us to dine there when on the dining plan. The easy breakdown, just a simple way to think about the value of one credit. The current cost of the DlxDP right now is roughly $110, divided by 3 Table Service meals per day puts the value of those credits at $36 each. There are certainly other factors, like the snack credits and the refillable mug, but for the sake of simplicity just consider it to be roughly $36. So, if you are not getting at least $36 worth of food (non-alcoholic beverage, appetizer, entrée, and dessert), you are losing money. One of the most important factors to me is to make sure that we get our money’s worth. It wouldn’t be beneficial in my opinion to purchase the Deluxe Dining Plan and then lose money. It would be difficult to eat 3 large meals each day on the DlxDP so we tend to only use it for one night stays, in order to split it between two days. We also have the Tables in Wonderland card, which is an additional option for those who are FL residents, Annual Passholders, or DVC members, this is a 20% off dining discount card. Many times we will plan around using the Tables in Wonderland card instead of the Dining Plan. I like to check menus online first to see what is available and then decide what I think I would be inclined to order. I have made up spreadsheets and calculated out hypothetical scenarios and found out how much will be saved on the plan vs. out of pocket using our TiW card. The dining plan does not include gratuity, so that is something I also factor in. I’m just going to refer to this as the Free-style method, this is how many people feel about dining plans when they do not care to look at dollars and cents. They like that the DlxDP gives them freedom to eat however they like without having to worry about the sticker shock at most Disney restaurants. For many people, the pre-paid dining plan provides them with peace of mind that there will be little or no added costs for food purchases as their allotted meals, snacks, and refillable mugs (resort fillable, not theme park fillable) are covered. 1) The Dlx DP includes an appetizer for lunch and dinner meals at restaurants that have a la carte menus, whereas the regular dining plan does not. Keep in mind that breakfasts do not include your appetizer entitlement. Buffets or family-style restaurants also do not include your appetizer entitlement. So, eating at these places immediately costs you the value of the appetizer course. Some appetizers are meant to be split between 2 people, those are usually marked on the menu. 2) Breakfast and lunch are the cheapest meals of the day. 3) Your non-alcoholic beverage can be a milk-shake or smoothie (if available, see menus, and check if item is free-refills or not). 4) Using two Table Service credits at most signature restaurants is not a cost effective strategy. 5) Using your Table Service credit at a Quick Service restaurant is not a cost effective strategy. 6) Always remember to check your receipts that the correct amount of dining credits have been used and that no mistakes have been made, you should keep track of your entitlements. 7) Always use up all of your snack credits and meal credits. By not using them, you are leaving money on the table! Those credits will expire at midnight of the day you checkout. 8) Check menus online to see what the offerings are and how much they are, go ahead and get steak or seafood! You can find out ahead of time which restaurants and snacks cost effective. Snacks closer to the $5 mark are a better value, however, you have to use those credits anyways. 9) The meal plan is more cost effective for meat eaters, it’s just a fact that vegetarian dishes cost less. 10) Try not to use your snack credits on bottled water, you can get ice water at any quick service location free of charge, no purchase necessary. No matter how you ultimately decide to use your dining plan, keep in mind these factors and plan accordingly to what is best for you and your group. You may end up using a hybrid approach, I can definitely see why this would be practical for those who are using the plan for their vacation, since eating 3 large meals a day is almost impossible for even the most stout-hearted foodies, so using 2 dining credits at signature restaurants and the dinner shows can indeed be a way to use up those credits. I hope that you have picked up a few tips for your next Disney vacation. Please leave any questions, comments, or to add your own tips.